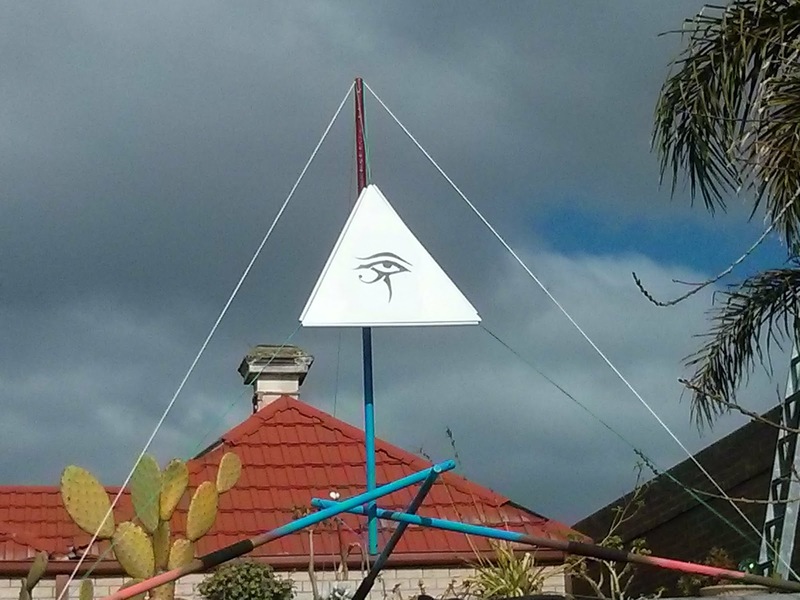 I build already a few versions of (truncated) chestahedra, one of them most likely still on display in Queensland, the rest of them embellishing my home. My "quick and dirty" way of transforming a geometric structure into a tensegrity basically cuts off the corners, with as many struts as the geometry had edges. 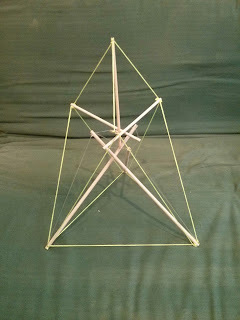 The network of strings therefor doesn't properly reflect the original geometry, with the exception of the 4-strut tetrahedron. Truncation basically produces the "dual" of a Platonic solid. Cutting the corners of a cube creates the octahedron, cutting the corners of an octahedron brings back the cube. The number of faces becomes the number of vertices, while the number of edges remains the same. However, this beautiful relation does only really exist between hexahedron (cube) and octahedron, and between dodecahedron and icosahedron. 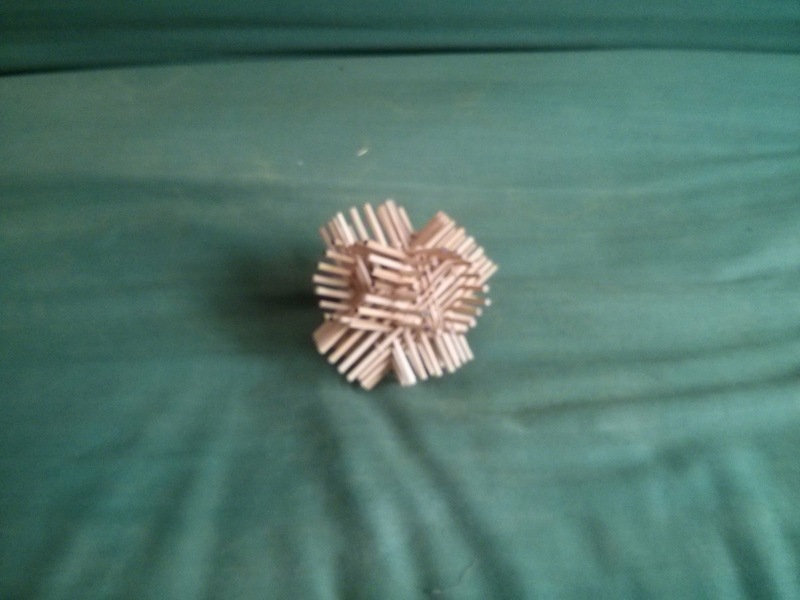 Applying the same algorithm to non-Platonic solids creates still very interesting transformations. The chestahedron, which can into human consciousness just very recently, also has a dual, the decatria. I'm surprised that it took me two years from finding out about the chestahedron to learn about its dual, which still is more than a mystery to me. I know it has 13 faces, 19 corners and 30 edges, mostly likely three different kind of faces. I still struggle to understand the 2d images I saw so far, how many different edge length are involved, so I delayed the ambition to "tensegrify" the decatria. I got inspired, however, to build a chestahedron similar to the 4 strut tetrahedron, using the tension elements to outline the wireframe version of its geometry. 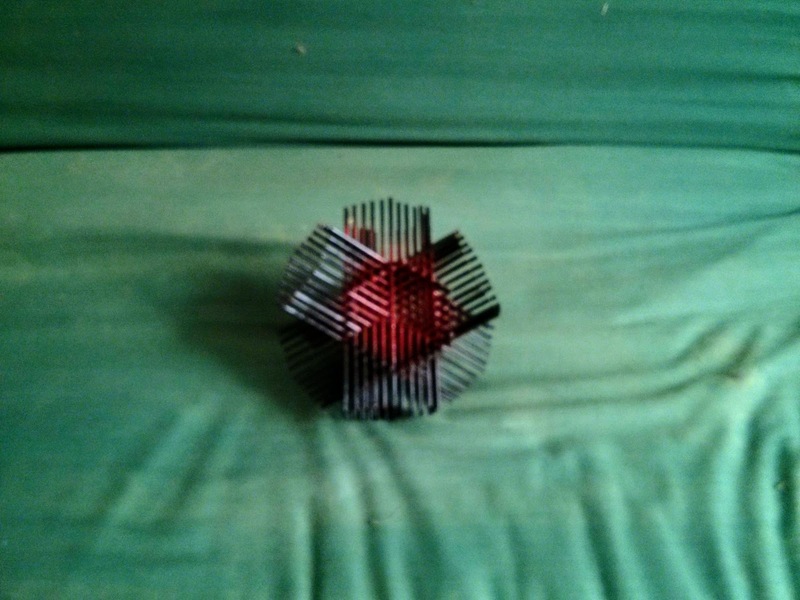 I struggled a lot when tried this for the octahedron, failed completely for the cube so far. The six strut icosahedron doesn't need the additional six strings to unveil it's "true" geometry, my ten strut dodecahedron usually ends up slightly imperfect, with most pentagons not being really symmetric. I ruminated a lot before getting hands on, using my experiences of building asymmetric structures to have a plan which made sense to me. I got frustrated on earlier attempts to construct things which seemed initially possible, but then turned out quite different. 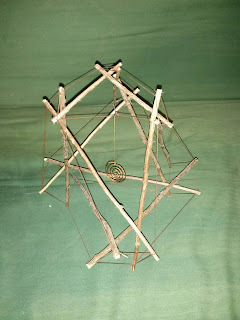 The idea to use seven struts for building a seven-sided object with seven corners kept me going. 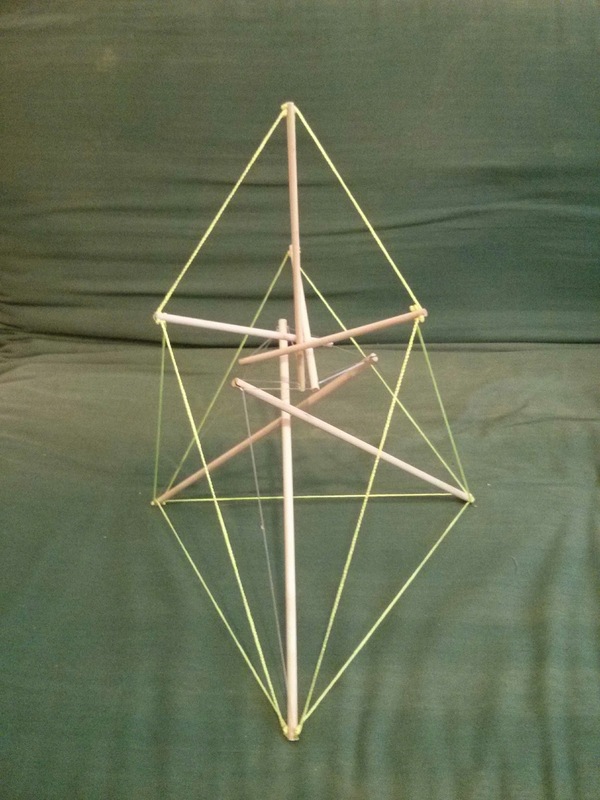 As the chestahedron has an unfolded tetrahedron at its base, the first tensegrity shape conceived in modern times might provide a great starting point. This constellation was build in the 1920s before the term "tensegrity" was coined. My first attempt followed my intuition. I chose three different length for the struts: 30cm for the base, 20cm for the vertical riser, and 15 cm for the middle section. The length for the outer tension network were simple, using the edge length relations Frank Chester published for the chestahedron. 9 strings were knotted to 30 cm, 3 more to 16cm, for a 0.53 ratio between top and base edge. In the truncated version, the top seemed to sink a bit in, distorting the beautiful relation of the solid object. 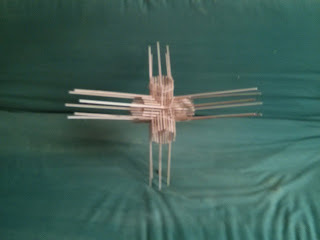 I started off as minimal as possible, connecting the three base struts with a string loop which served to received the three shorter struts for the middle section as well. The central riser was supposed to connect to the outer string network, and three pieces of elastic string connected to the top end of the base struts. It was relatively straight forward to get everything together. All I needed to do was to connect the bottom of the vertical riser to the top of the base struts, creating an expansion from bottom to top through the inside which should be limited by the tension network on the outside. It got a bit fiddly, all seven sticks come together fairly close in the centre, but there were only two connections to go.... and then everything fell apart in a tangle of sticks and strings. So decided to use some transparent elastic string to stabilise the base, making a classic nine string, three strut tensul out of it. It still took some dexterity to finish it, yet this the little deviation from making it as minimal as possible provided a satisfying prove of the concept which emerged less than 24 hours in my mind. Elastic string always allows a bit of leeway, and I used it sometimes to draft models. 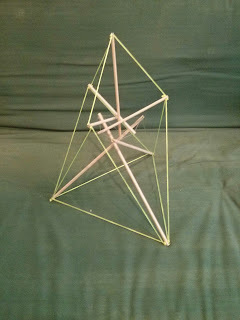 Some of the four strut tetrahedra combine elastic string in the centre, and non-elastic on the outside. Non-elastic string requires much more precision than elastic, but besides this, I love the "invisibility" aspect of it. Frank Chester mentioned that geometric shapes act as scaffolding to manifest physical objects, so I'm perfectly happy to have some transparent scaffolding still in place. I probably stopped using non-stretchy string for smaller objects after having some careless punters breaking my sculptures. I think it was Edison who mentioned that "you cannot make things foolproof, because fools are so damn inventive". 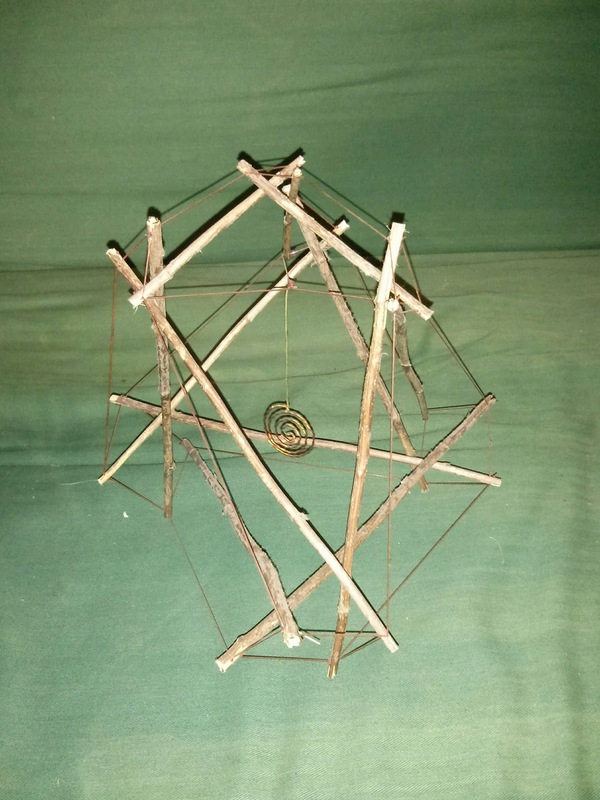 I liked the idea to show the framework of a chestahedron with the outer tension network of a tensegrity, while hiding the supporting inside tension with transparent string. When I measured the draft I made, I noticed some variations of lengths, so I chose some very similarly prepared struts and dedicated some time to prepare my strings with as much precision as possible. 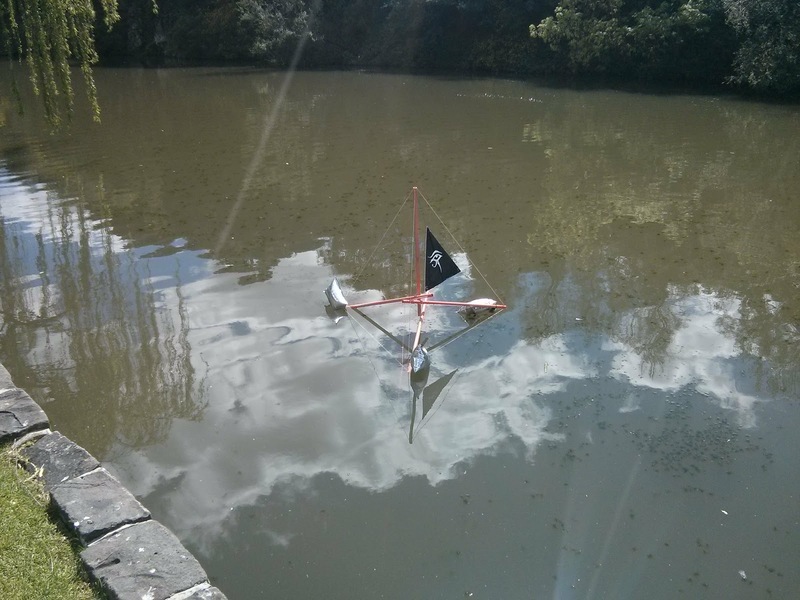 The second model looked promising already in its early stages. All the supporting tension elements are now made with transparent string, symbolising the invisible forces. 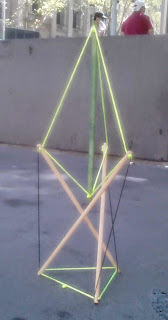 I still needed two attempts to find a good length for the strings supporting the vertical riser. The final version has a relaxed amount of tension. As it's not really meant to be stressed heavily, I'm quite confident that it will maintain its shape for years to come. Here you go. An object with seven vertices, seven faces made with seven sticks and seven supporting transparent strings. Can it get any better? Most certainly. I used three different length for the struts, introduced new length for the invisible support. The perceived centre moved up, although it still seems to divide the structure with the golden ratio. Now that I know how to build a version of it, I'm curious how to explore this shape even more. It's close to my heart.... as it is the scaffolding needed to create a heart in first place. Stay tuned. Winter has gone, and I got more curious whether my idea to float a tensegrity holds water. The disassembled structure, some 2 litre bags and the bits and pieces needed to put it all together fitted into a backpack, with the struts sticking out a little bit. So I took my trusty unicycle and made my way to Coburg Lake. Like most of the time, it took a while to untangle the mess of strings. The attachment of the floatation bags needs improvement, but despite the slightly dissatisfying looks worked just like planned. As I didn't want to leave the structure behind, l tethered it to some string to get it back out. I enjoyed watching my piece slowly drifting along, adjusting the tether to prevent it from snagging on branches and finding different viewpoints. Taking footage didn't work as well as I wanted to, I guess a camera mounted on a tripod will do a much job in capturing more spectacular images. Lasting outdoor installations don't come easy. My first garden decoration survived about two years, yet it became nearly invisible much earlier. A pea grew over it, which most likely made the strings indistinguishable from them, and they got pruned. Mottled Heart needed some fixing while the tomatoes were growing through, but currently still opens a bit of space next to a rosemary bush. The steampunk tensegrity has been relocated, but I missed an opportunity to take a shot of it in its appreciated location. My last release of an outdoor structure survived for about nine month, long enough in the same spot to bleach parts of the conduit. I noticed that someone didn't like it on the bare patch, but moved it closer to the fence. I doubt the intention involved increased visibility from the bike path. Two beehives and some compost heaps appeared in the same space, and maybe the new custodians didn't consider my art appropriate. When I couldn't see it anymore, I went onto the common area to find traces of what happened. I found the collapsed heap of strut near to where it used to lounge next to the fence, and reclaimed them. All strings still connected, none of them cut, meant someone forcefully collapsed to it through the centre. While the string I used seems flimsy compared to a rope, it loses only little tension over time. I used holes instead of grooves in the rim as attachment points, so upgrading the sculpture with a panel turned out a bit fiddly. Corflute provides an ideal material, weather proof, relatively stiff and tear resistant. I used cable ties as attachment point, I'm eager to try simple small holes to secure the string. This version has gotten some severe beating by the wind lately, helping me to improve the durability of the attachment. I build the first version of this idea in much sturdier ways, but I still couldn't do without cable ties. Even the wooden structure weighs only little, I'm looking forward to float these structures on a body of water. 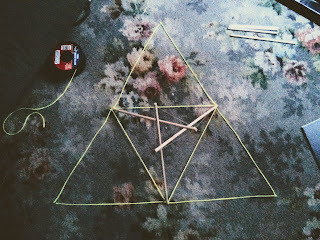 I deviated a little bit from building tensegrities with hexastix, yet my knowledge of geometry helped a lot. 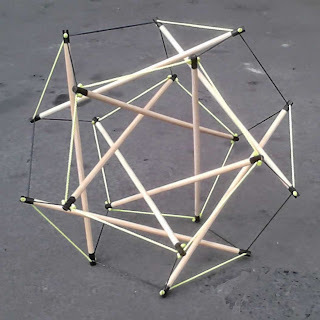 I don't really know whether George Hart came up first with the idea to weave sticks (pencils) together in a double tetrahedral way, his sculpture 72 pencils usually pops up soon when researching them. I found an instructable how to build hexastix, but I didn't like the idea to build a jig first. Luckily, I managed to dig up a cached copy of a different way to put it together, requiring just some rubber bands and patience. As I still have an ample supply of sticks in various diameters and length, rubber bands aplenty and still some patience, I gave it my first shot. While I was happy with the result, I didn't like the idea to douse the entire structure in glue to make it solid. The rubber bands keep each of the eight hexagonal opening together, but only two of corner of each hexagon aren't held in place by the weaving pattern. A bit of wood glue fixed the most critical ones, and while most sticks can slide around, the object can be handled with disintegrating. Encouraged by the first success, I decided to bring more colour into it. The colours emphasise the four intersecting axis of the object, but don't really make the double tetrahedral structure obvious. I haven't bothered yet to fix it with glue, so you see the rubber bands holding everything in place. 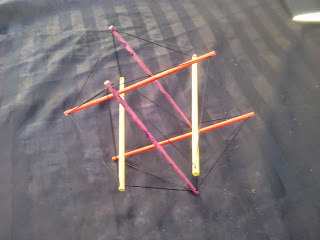 I realised that the pattern could be easily extended, the level 4 hexastix has 102 instead of 78 sticks. 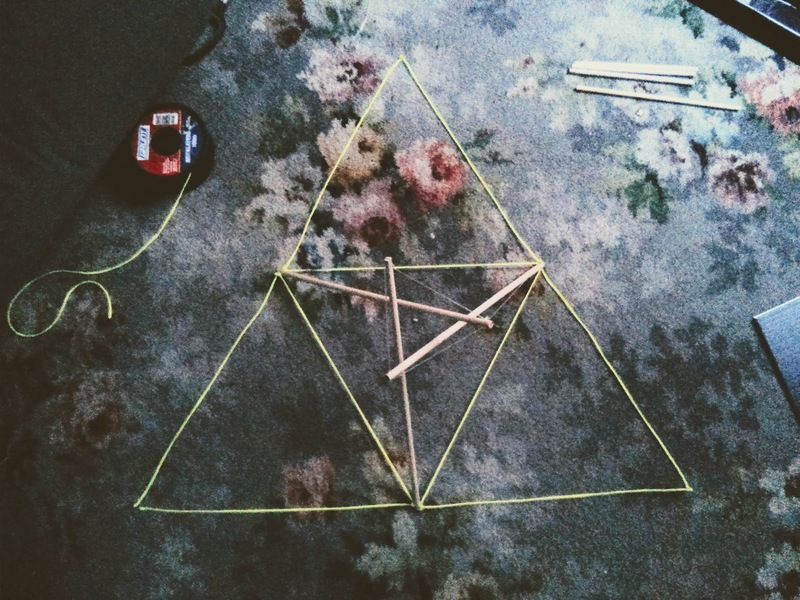 By placing the longer sticks in a way they they only stick out on one side, the tetrahedral base structure becomes more obvious. 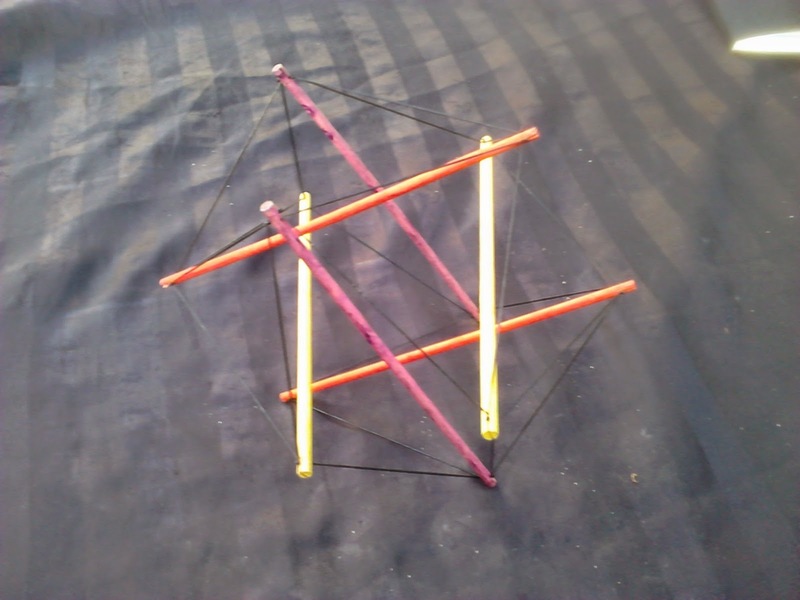 I did the bamboo skewer hexastix mainly to find out whether I still needed instructions, and realised that I finally understood the construction well enough to do it without any photographic help. Now I focussed more on having a pleasing relation of the core of the object to the extending hexagonal columns. 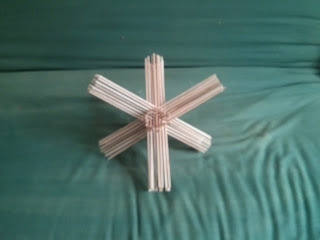 The sticks in the Level 5 hexastix have only 2mm diameter, so to change the aforementioned relation I either had to use much shorter sticks, or expand it with more sticks. This object has 126 sticks, and after glueing the corner sticks into place I gave it a bit of a paint job for more aesthetic appeal. The last variant explores shorter sticks, going back to 78 sticks. 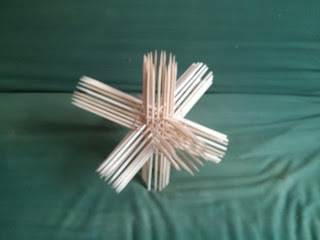 It is still held in place by rubber bands, fixing only the sticks which need to be glued in place. I'm convinced that I build it exactly the same way as all prior version, but for some unknown reason I need only fix three of the four hexagonal columns. Five out of the six hexastix I build display the same pattern when looking towards the core, the last one has two different ones. The geometry of the hexastix offered some surprises to me. It's basically a merkaba shape, two intersecting tetrahedra. It always feels exciting to release some of my pieces into the wild. I never know what will happen, who long it will occupy a location or survive the outdoor conditions, whether I can take a good shot in proper light conditions. 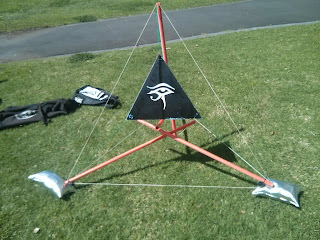 I decided to let go of the tensegrity which served me as display while busking today. 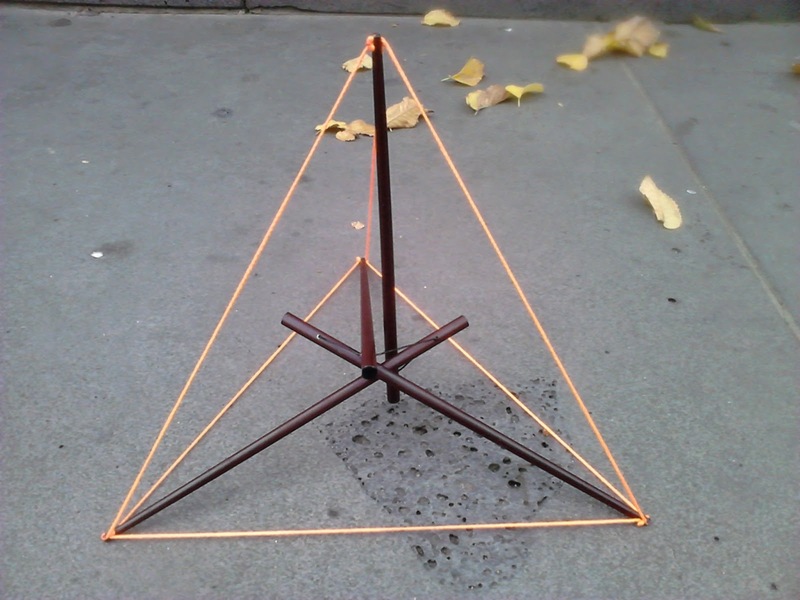 It's a four strut tetrahedron made of orange conduit which travelled lots. I build it for easy assembly and disassembly, easy to fold away and needing only one strut to connect with three strings to become whole. Some of my pieces have travelled more than this one, which I never really bothered to name. I like the bold orange of the material, less so the black print giving away its industrial origin. The white string wears the stains from the different surfaces it encountered during its journeys. The imperfect white and the surplus black print give it honesty and rawness though. 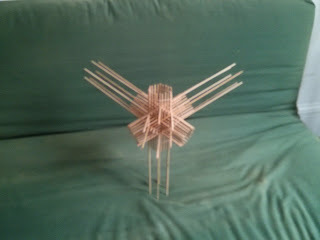 Similar sized structures with thin bamboo tended to collapse in itself, I used the stiff conduit mainly to find out how to build stable minimal tetrahedra. It certainly deserves the status as stepping stone. 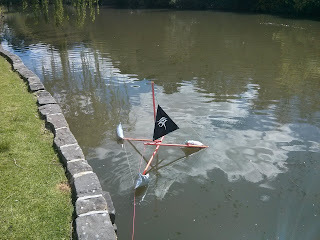 I dropped it from about 3 metres to test the integrity, and still remember the big smile over the results. 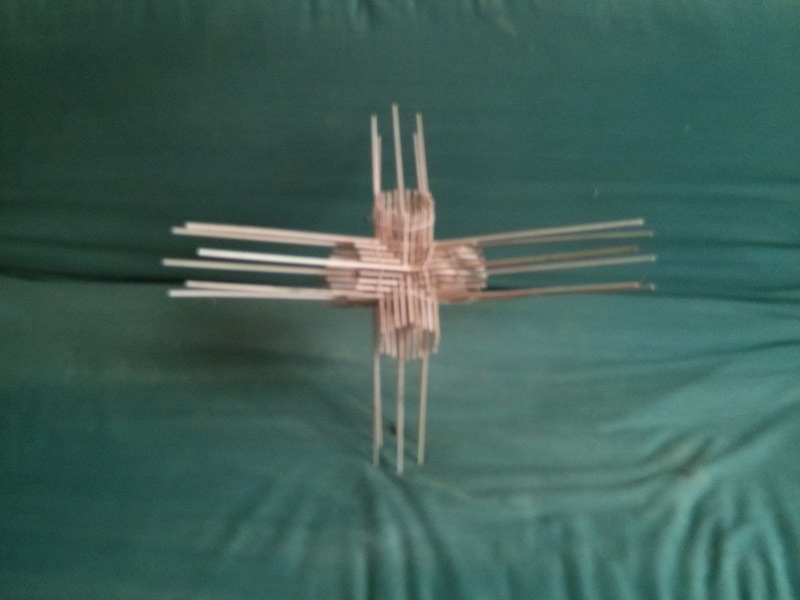 It still offers the spectacle of a decent sized tensegrity, yet I build more aesthetically appealing versions, better suited to showcase smaller tensegrities. One of them now became invisible after sweet peas grew over it, hiding the decay of the wood I didn't anticipate. Yet my perspective and appreciation of my work differs a lot from those experiencing 3d tensegrities rarely. Without hardly anything to compare it to, the novelty wins out. I learned to appreciate the impermanence of my creations, having kept only a couple of pieces from the early stages. So it felt just right to let go of an object created for its mere function. I chose a location which has been used for a communal art installation prior, a small patch of land fenced off between an old warehouse, a bike path and an apartment block called 'The commons'. 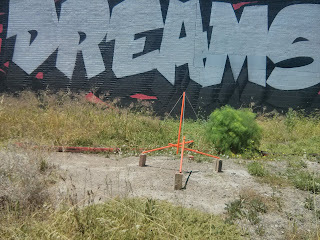 It has small patches of concrete, surrounded by weeds, against the back drop of a mural spelling out 'Ideal Dreams'. It took me quite a while to get it back together, it must have been a year or so since I last put this one up. 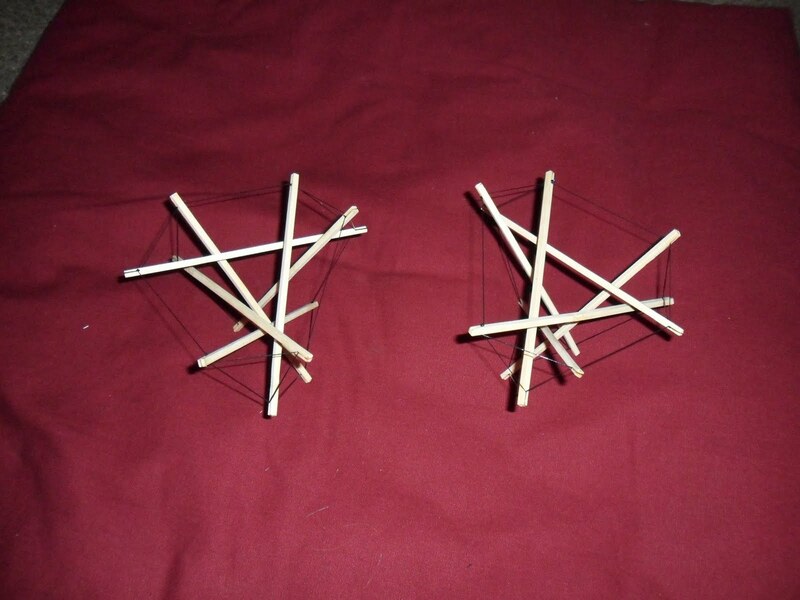 The four stick converge in the centre of the tetrahedron, and once the sticks and strings criss-cross each other in the proper way I just need to connect three strings to a single strut. Getting this configuration still resembles a complex 3d puzzle. While I was figuring out how it all goes together, I heard someone calling out "Hey boy, what are you doing there?" I turned around to three women on a balcony facing the patch I was on. :just building something." I answered. 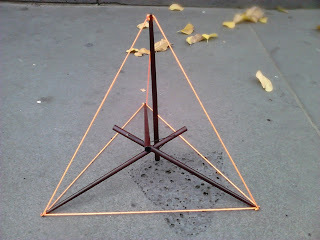 Luckily, I had solved the puzzle and finally the tetrahedron was back in shape. I offered to take my work back home if they didn't like it, but they took no offence to it. 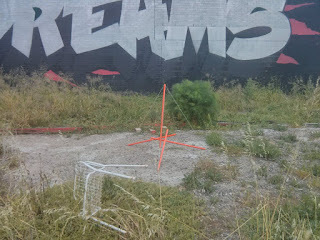 Even more surprising, one of them identified it as tensegrity, so I didn't mind at all being caught in the act of embellishing an unused patch of land in Brunswick with one of my pieces. I checked the visibility from the bike path, and noticed some old chair spoiling the view a bit. When I moved it away, I spotted some bricks, and decided to prop my structure onto it. Somehow, I screwed up the shot of the final result, yet I'm confident that it will stay there for a while. Call me a bad marketeer for failing the instagrammability, I just enjoyed the process more than documenting the result. Using bricks as 'corner stones' highlights the delicate balance of the structure, and moving the chair away adds to the idea of a deliberate installation. I use this part of the bike path a lot, so it'll be interesting to find out how it will stay in this location, and how it works visually at different times of day. Once I started understanding the slightly irregular geometry of the Chestahedron, I grew fond of it. Two variations of it now decorate the Neurophysics Functional Movement Centre in Queensland, as well as being used to demonstrate complex processes. Even without anything suspended from the top, the Chestahedron favours an upright position in relation to gravity. 'Chiming Heart' was sized to fit into a 50cm cube, made of non-elastic string and Tasmanian Oak. It has a Chinese Bell as attachment, introducing more moveable elements to a relative sturdy structure. 'Fiery Heart' needed to be more moveable, even the small weight of a bell (ca. 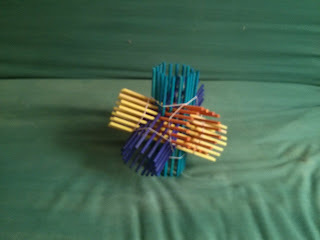 one ounce) put too much stress on a similar structure with elastic strings. I decided to use non-elastic string for the lateral 'corners' to maintain the overall shape after distortion, and to make the non-elastic attachment point part of the tension network. While I used whatever I could find as attachments so far, I needed now something of decent size, low weight and potentially bell-shaped. 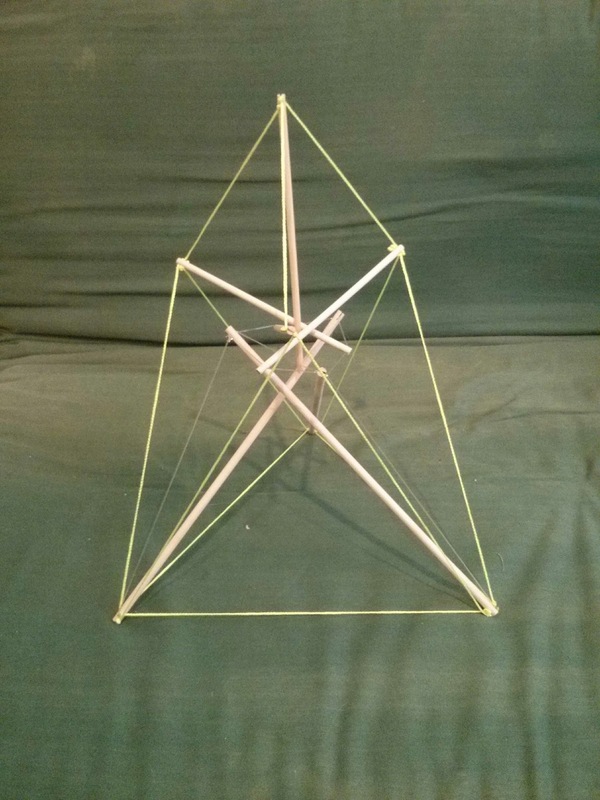 A small 6-strut tensegrity tetrahedron fits the bill perfectly, creating pleasing size relations. Some dashes of colour high light this centre, combining the shape for Fire with its colour red. Meanwhile, 'Mottled Heart' gets taken over a by tomato, rosemary and mustard. The dodecahedron on the roof suffered a bit with the stormy weather lately, but 'Mottled Heart' shows only slight fading of the strings. I wonder whether its attachment will interfere with the mustard underneath, it won't take long before I find out. The last post about the chestahedron called "Mottled Heart" went a little bit all over the place, as I wrote it in multiple stages before the piece went to its final destination. So let's rewind and start at the beginning. The artist Frank Chester set out on a mission to find a geometric structure with 7 equally sized faces. After many explorations he discovered the chestahedron, an object with 7 faces (four equilateral triangles, three kites) and 7 vertices. The structure does not qualify as Platonic Solid, as it has two different edge lengths and two types of faces. As the structure bases on a tetrahedron folded open, it elegantly relates to all Platonic Solids, as well to a sphere surrounding it. According to Chester, the structure represents the geometry of our heart, please check out his talks for a more in depths explanation for this. 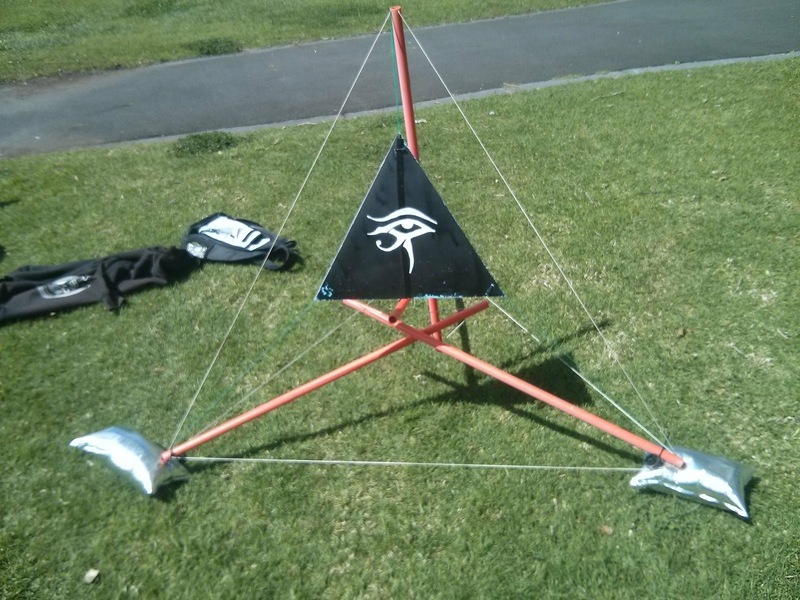 When I followed a presentation about the genesis of this shape, my mind got blown several times, inspiring to seek some hands-on experiences with it. In my first experiments I got the length for the top three struts wrong with only slightly satisfying results. Luckily, I found out the proper numbers, so that the latests builds give me better ideas about the qualities of this unique structure. 1) All edges of the wireframe model become struts. 2) Each strut gets a string roughly 10% longer than the strut length. 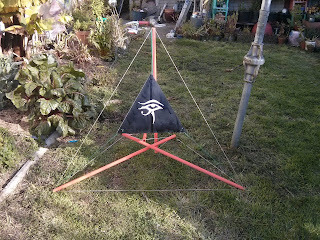 3) The string network reflects a truncated version of the base geometry, eg the strings of my 6 strut "tetrahedron" create a truncated tetrahedron. 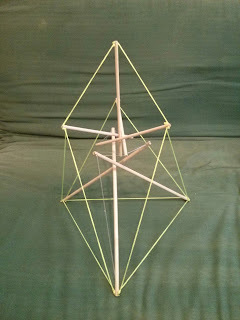 5) Building of the tensegrity starts with a 'corner', eg connecting three struts with the strings shaping a triangle to begin building tetrahedron, cube or dodecahedron. 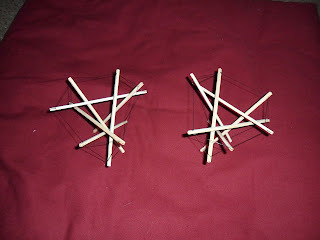 6) Each string connects to two more stick ends. 7) Repeat building 'corners' at the second string attachment position and continue until structure completed. This simplified version works out fine for all Platonic Solids, it seems to fail for complex intersecting geometries like star tetrahedron. It worked well for the chestahedron, although, if you're really pedantic, the strings represent of truncated chestahedron. 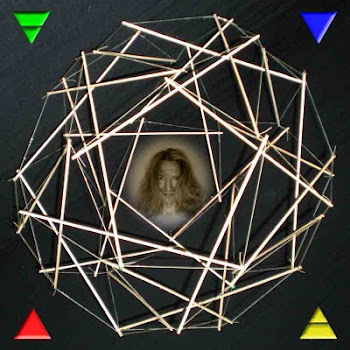 While geometrically interested people can perceive and identify the Platonic Solids in its representation as truncated tensegrity, the names of these geometric shapes evades a majority of people. Our consciousness seems to resonate with geometry. The symmetry of it appeals to our perception of beauty, and it doesn't really matter whether we can put a name to a structure we experience. Architecture and engineering rely traditionally on squares, we have on overabundance of distorted cubes arounds us. Mobile architecture utilises triangles much more, and geodesic domes offer a nice relieve of the geometrical desert which most urban landscapes offer. The chestahedron hides the numbers 1 to 7 in an elegant and surprising way. 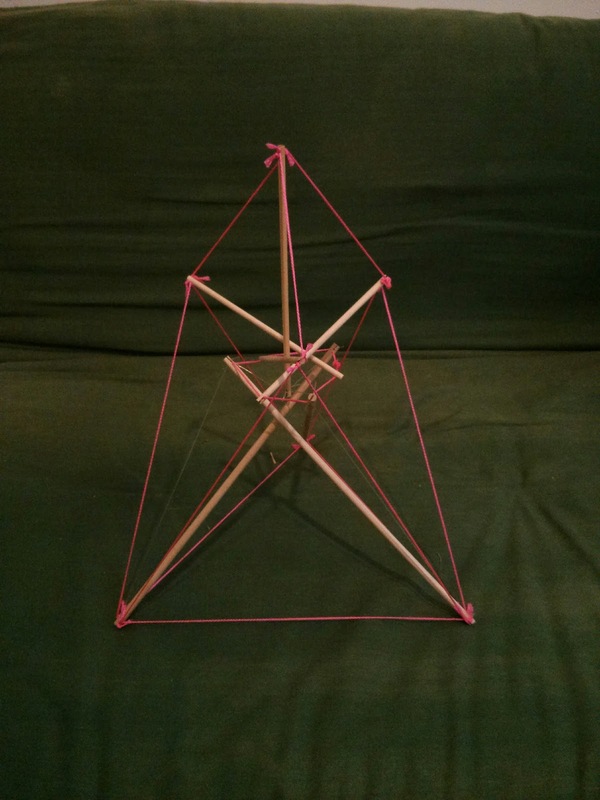 1 object created from 2 base structures, a 4 sided tetrahedron, and 3 slices of a 5 pointed pentagram shows 7 corners and 7 faces. 6 edges shape a perfect hexagram through the centre of a sphere surrounding the chestahedron. I played around a little bit with less symmetrical structures, but the majority of objects I build and sold showed multiple symmetries. I build some bases for spheres, there's often no clear up and down in my objects. 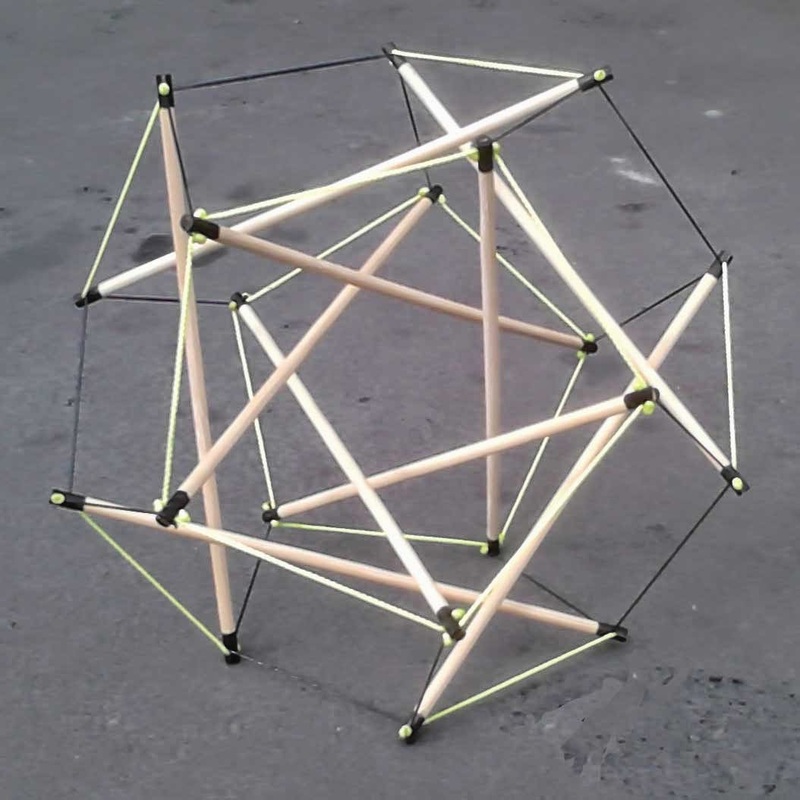 The chestahedron breaks this mould - it commands like an obelisk to be put on its base. It invites to have something suspended from the apex. The effect of a counterweight can be compared to someone pushing the object to the ground. As long as the counterweight doesn't move, which will happen. Without anchoring I could easily topple the structure over by moving the pendulum much out of centre, yet there was quite a lot of range of movement in a stable state possible. With only about 80 cm height, "Mottled Heart" stands in a relatively sheltered space, surrounded by a planter box and equally high plants. 3 plastic tubes, fitting snugly over the bamboo sticks, anchor it about 10cm into the ground. Most of the time I saw it moving. I wonder how weathering will effect the stretch in the material, I anticipate a vast visual improvement. As I recycled the struts from a first experiment to paint on bamboo, the paint will wash and weather off. The strings will bleach off, the spot will get more and more sun exposure the closer summer gets. I know how to improve the immediate visual appeal of the materials involved. While I was busking, I experimented a lot with colour, just a learn more about the fierce Australian sun than I wanted to. If something looks good outdoors over time, it works with nature and not against it. Oiling plant surfaces can provide interesting graceful ageing of material. Instead of being the trickster, stunning by the immediate shineyness of their illusion, I let Mother nature do her part of trickery. If the "Mottled Heart" still beats a year from now, it will look quite different. 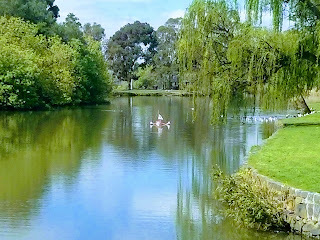 Until then, I can enjoy seeing the calming movement reminding me of eternal change.